Northrop & Johnson — the authority on yachting since 1949 — will be on hand at the 2018 San Diego International Boat Show. Northrop & Johnson is an international yacht brokerage with 13 offices around the world; three based in Southern California alone — Newport Beach, San Diego and Los Angeles. Sales and charter brokers from all of the California offices will be available at the show for viewings, meetings and to assist you with all of your yachting needs, from sales and purchase to new construction, charter management and charter retail. 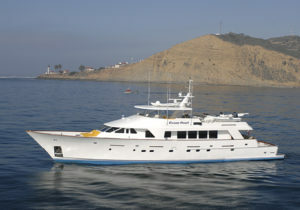 Northrop & Johnson has a variety of luxury yachts both in the show, including the the 115-foot (35.05m) Christensen OCEAN PEARL and the 70-foot (21m) Mikelson LEGACY, and available in the area. To schedule a meeting with a broker, a viewing on board a yacht or for more information on Northrop & Johnson at the show, please contact NewportBeach@NorthropandJohnson.com or contact your preferred Northrop & Johnson sales or charter broker. Or call +1 949 642 5735.